Description: As they were entering Egypt, Abram glimpsed Sarai's reflection in the Nile River. Though he had been married to her for years, this moment is positioned in a rabbinic narrative as a revelation. "Now I know you are a beautiful woman," he says; at that moment he also knows himself as a desiring subject, and knows too to become afraid for his own life due to the desiring gazes of others. There are few scenes in rabbinic literature that so explicitly stage a character's apprehension of his or her own or another's literal reflection. Still, Dina Stein argues, the association of knowledge and reflection operates as a central element in rabbinic texts. Midrash explicitly refers to other texts; biblical texts are both reconstructed and taken apart in exegesis, and midrashic narrators are situated liminally with respect to the tales they tell. This inherent structural quality underlies the propensity of rabbinic literature to reflect or refer to itself, and the "self" that is the object of reflection is not just the narrator of a tale but a larger rabbinic identity, a coherent if polyphonous entity that emerges from this body of texts. Textual Mirrors draws on literary theory, folklore studies, and semiotics to examine stories in which self-reflexivity operates particularly strongly to constitute rabbinic identity through the voices of Simon the Just and a handsome shepherd, the daughter of Asher, the Queen of Sheba, and an unnamed maidservant. In Stein's readings, these self-reflexive stories allow us to go through the looking glass: where the text comments upon itself, it both compromises the unity of its underlying principles�textual, religious, and ideological�and confirms it. 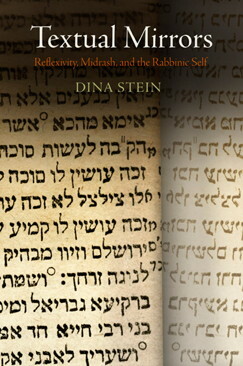 Citation: Simon Lasair, review of Dina Stein, Textual Mirrors: Reflexivity, Midrash, and the Rabbinic Self, Review of Biblical Literature [http://www.bookreviews.org] (2014).